Have Just One Day on Oahu’s North Shore? Do This! The winter swells are starting to make their way to Oahu’s North Shore. And, that means it’s time to plan your visit! But, what if you only have one day to spend? 1. Visit the famous surf spots: Especially in the winter, when the swells are huge, you don’t want to miss the opportunity to see some of the most famous surf spots on Oahu. I would recommend you visit at least three: Sunset Beach, Banzai Pipeline, and maybe even Velzyland would be great options for a visit. 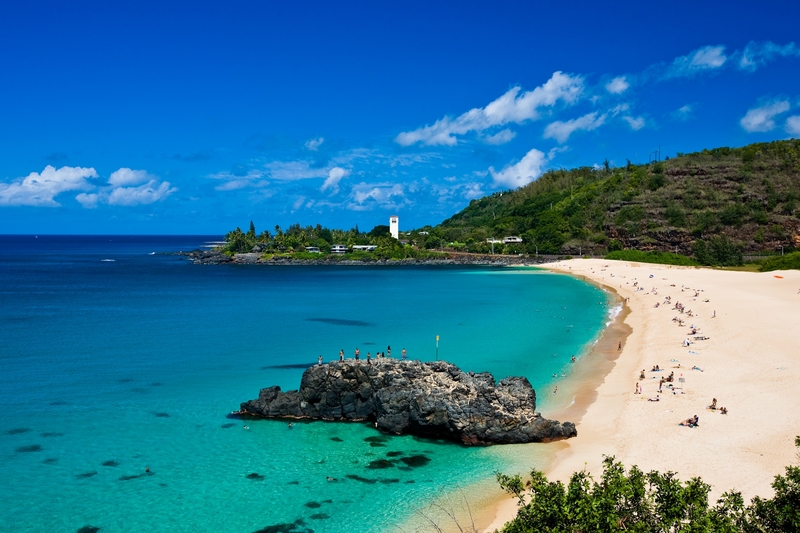 Waimea Bay is one of the most picturesque spots on Oahu. There, you can even jump off a nearby cliff--if you're brave enough! 3. Hike Waimea Valley and play in the waterfall: If you’re looking for a postcard-picture-perfect venue, then Waimea Valley is it. Upon entering, you’ll see a lush, green valley flush with peacocks, green lawns, and mountains. I can’t think of a better place to spend the day. Just follow the marked trail to Waimea Falls, take your shoes off, and jump in! 4. Swim with the sharks: If you still have two hours to spare, make sure you book a North Shore Shark Adventure through Hawaii Aloha Travel. The shark “mano” is still central to the culture of Native Hawaiians. And, after you spend a day with them, you’ll see why! You will leave Haleiwa Small Boat Harbor and travel out to sea to view these beautiful creatures. Often on the way you will also view Dolphins, the Hawaiian Green Sea Turtles, and in the winter months, the famous Humpback Whales. All this, and a breathtaking view on Oahu’s North Shore are part of the tour. During the winter (and even in the summer), you'll want to stop by some of the best surf spots on Oahu's North Shore. If the swells are big, you'll often see big wave surfers giving it their best shot! 5. Shop in Haleiwa Town: Haleiwa Town has become the social and artistic hub of the North Shore, and you won’t find a more ecclectic surf town anywhere in Hawaii. Watch as the surfers fuel-up for a day of surfing. Then, patronize some of the local restaurants and art galleries. Don’t leave without having a drink at one of the local cafes, as you sit and people-watch! If you have just one day on Oahu’s North Shore, make sure you pack as much adventure as possible into it! So, use our suggestions as your guide as you enjoy this amazing part of Hawaii.